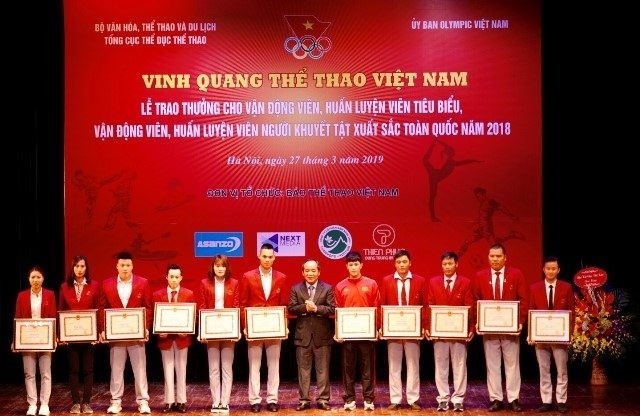 HÀ NỘI — Outstanding athletes and coaches were honoured at a ceremony in Hà Nội on Wednesday to mark the 73rd anniversary of Vietnamese Sports Day. Addressing the event, Vương Bích Thắng, head of the Việt Nam Sports Administration, said 2018 had been a striking success for Việt Nam’s sports sector on the international stage. The U23 team finished runners-up at the Asian Football Confederation U23 Championship for the first time, while Việt Nam won the ASEAN Football Federation Suzuki Cup for the first time in ten years.